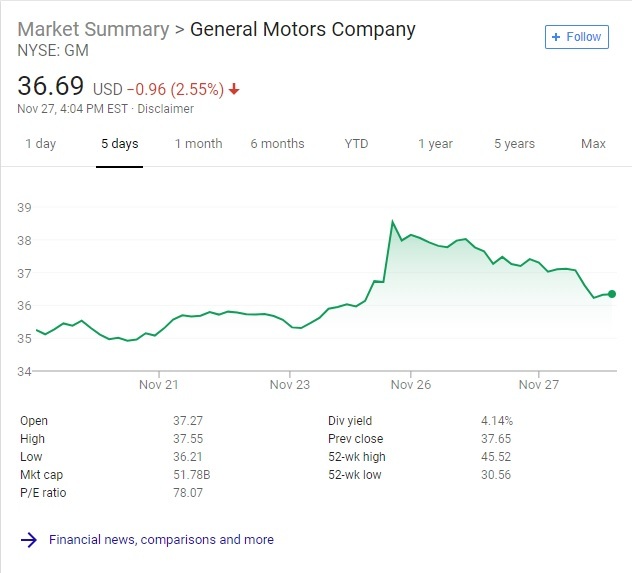 What goes up must come down at some point, and General Motors’ stock plummeted in an instant Tuesday after a couple of threatening tweets from President Donald Trump. On Monday, GM announced it is slashing 14,000-plus jobs — about 15 percent of its entire salaried North American workforce — and closing up to five plants in the U.S. and Canada. The announcement that GM was refocusing on autonomous and electric vehicles sent the company’s stock soaring nearly 5 percent to $38.54 a share by the closing bell. The move is going to save the company about $6 billion. On the campaign trail, Trump promised Ohioans that not only should they not sell their houses and move elsewhere, but in fact he would bring their jobs back. One of the plants that is likely to close is in an Ohio community near Youngstown, where it is the economic lifeline of an entire valley. Without it, thousands more will be without jobs, making the president look bad in the process. Youngstown is a Democratic stronghold in Ohio, where Trump won a large number of voters because of his promises to bring back jobs. The plant will stop producing the Chevy Cruse in March, halting work at an assembly plant that’s already lost two shifts and 3,000 union jobs since early 2017. Trump made his thoughts on GM’s job cuts crystal clear Tuesday morning in an interview with the Wall Street Journal. “They better damn well open a new plant there very quickly,” Trump said. And then came the tweets, shortly after lunch on Tuesday. … for electric cars. General Motors made a big China bet years ago when they built plants there (and Mexico) – don’t think that bet is going to pay off. I am here to protect America’s Workers!” he said in a two-tweet thread. GM was the beneficiary of a government bailout in 2009 under President Barack Obama’s as the company was headed for Chapter 11 bankruptcy. The president’s comments and tweets sent GM stock back down to earth a bit, finishing at $36.69 at the closing bell, down 2.6 percent for the day.